A CHRISTIAN IN LONDON AND PARIS is a tale of two cities I love. It is not a travel book but conveys something of the essence of these fascinating, historic cities. 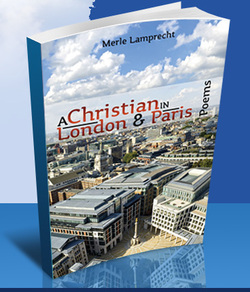 The book has 48 longish poems – 24 about London and 24 about Paris. Each poem presents Christian belief, values or thought against a background of churches, art, museums, places, people, parks, shops, events, eating out – in fact everything one does on vacation! The poems have many Scriptural allusions and the book makes an unusual, interesting and challenging read. As my stock is finished, A Christian in London and Paris is no longer available online. There is a free download below. Copyright: Merle Lamprecht 2009. Scripture references: NIV, KJV, NKJV. Published by WinePress Publishing. ISBN-13:978-1-57921-939-0. ISBN- 10:1-57921-939-X. Listen to the poet reading this poem.